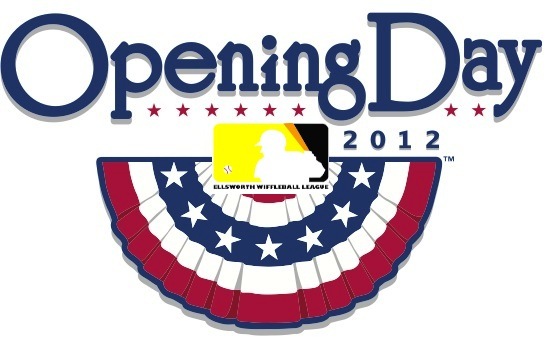 The schedule has been released, and the 2012 EWL season will start May 1 at 6:30PM at the Wiffle Diamond on Ellsworth Ave. There are some new faces, a new team, and rule changes heading into the upcoming season. Three of the four teams from the 2011 season have returned, as Pumice on Slow! and the Caucasians will try to prevent the Fish Sticks from repeating as champions. The league has lost the 4 out of 5 Dentists franchise, but has added the Ham Slams, by far the league’s youngest team. Their wiffle skills, masculinity, and patriotism will be tested this spring and summer. Some new rules have been enacted which will change the way wiffleball is played in 2012. The Left Field Tree: Balls hit into the left field tree will no longer be able to be caught for fly ball outs. Balls hit into the tree can be fielded like any other ball in play. If the ball is possessed out of the tree by a fielder prior the batter reaching first, the batter is out. If the batter reaches first prior to the ball being possessed by a fielder, he can be retired by being pegged in between bases or being caught in between bases while the ball is in the pitcher’s possession while on the mound. The Fence: Balls hit off the fence can no longer be played like groundballs to record outs. Balls hit off the fence must be returned to the pitcher on the mound prior to the batter reaching first base to record an out. Once the batter has reached first base safely, he can only be retired by being pegged in between bases or being caught in between bases while the ball is in the pitcher’s possession while on the mound. If a wooden board is present along the bottom of the fence, it is considered part of the fence. This rule only applies to balls hit off the fence (or the board) in the air directly. Balls that roll or bounce to the fence can be played like typical ground balls. Designated Hitter: Teams can now utilize a designated hitter to bat five players in a lineup at their discretion. Only four players can play in the field at one time. Intentional Walks: Each team can intentionally walk one batter from the opposing team once per 6 innings. If a game goes to extra innings, each team is awarded an extra intentional walk beginning in the 7th inning and will be awarded an additional intentional walk every six innings. Unused intentional walks can be carried over every six innings within the same game, but cannot be carried over to subsequent games. Baselines: The bases have been moved from 15 strides apart to 13 strides apart. Bases: The bases will be drawn in sidewalk chalk, which will replace the tile bases used last season. This is to reduce potential injuries from slipping on bases. The rule was proposed by Les of the Caucasians, who sustained the worst wiffle injury of the 2011 season. The week 1 schedule features a rematch of the 2011 Wiffle Series as the Caucasians meet the Fish Sticks, and the Ham Slams will break into the EWL by facing the Caucasians and Pumice on Slow!